Nima Bonakdar-Sagharchi Head of Department/Department Director, Modern and Contemporary Middle Eastern Art at Bonhams , responsible for putting together the company's Modern and Contemporary Arab and Iranian Art auctions, held bi-annually in Bonham's London salerooms.Oversaw the establishment of Bonham's first ever dedicated Modern and Contemporary Middle Eastern Art Category commented on Facebook on Ibrahimi collection on 31st of March 2018. 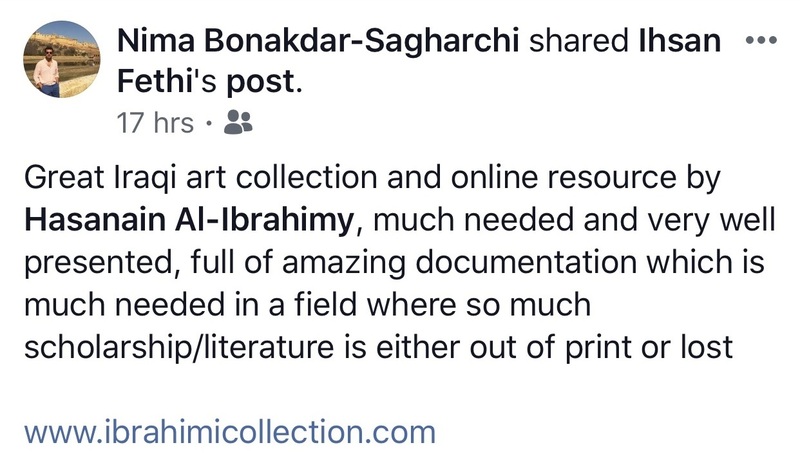 Copyright © 2019 ibrahimicollection.com, All rights reserved. developed by Blue Ray for Web Solutions.